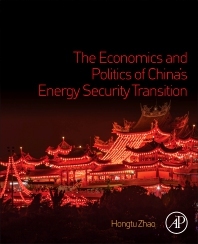 The Economics and Politics of China’s Energy Security Transition clarifies China’s energy and foreign policies through a comprehensive examination of energy sources, providing an insider’s unique perspective for assessing China’s energy policies. China’s historic decline in coal consumption since 2013-2014 and a plateauing of its carbon dioxide emissions have given China an unprecedented opportunity to decarbonize while growing its economy. In response to global questions about China’s institutional, administrative, and political challenges and risks, this book provides the answers that everyone is asking. 2. “Resource War”: Will Mankind Fight for Resources? 3. Resource Contention: Resource Control or Market Competition? 7. Energy: The “Achilles’ Heel” of China? Dr. Hongtu Zhao, a research professor at Institute of World Economic Studies, part of the China Institutes of Contemporary International Relations (CICIR), specializes in the study of energy and resource issues. His current field of study also encompasses global warming, unconventional security, and international political economics. A former visiting scholar in University of Wisconsin-Madison and Energy Charter Secretariat (located in Brussels), he has written and co-written several books, such as The Grand Chessboard of Global Energy and A Survey of International Strategic Resources.